I would like to thank everybody for taking the time to correspond with me during the writing of the Interactive Novel. I appreciate you making the time and effort to share your feedback. However, writing can be a lonely habit and no more so than in writing a first draft. Much better author’s than me advise against writing with the door open. And I happen to agree. Positive feedback and I begin to slacken off. Negative feedback and my motivation to finish drops. Therefore I believe in writing a first draft it is one of the those thing best carried out alone. In writing each instalment of the interactive novel I have to write each instalment in five days and revise it as many times as possible in that period. Each instalment has to link in the with story and lay the foundations of what may happen later without knowing or having any control of what will happen next. It makes it a daunting challenge. So where does this fit in with regards to your correspondence. During the writing period, I knuckle down and worry only about the story. But once that instalment is published and before the vote closes I do read all of your correspondence. I thank you and value all of the feedback that is given. It means a lot that you have taken the time out of your busy lives to read and take part. I thank you again. Now I have to get back to writing the fourth instalment and just like you I look forward to finding out what happens next. Fourth Instalment published Monday 19th November. Thank you everybody for voting on the choices at the end of the first instalment of the interactive novel. I must admit the results have been surprising and as I sit down at my keyboard this morning I am looking forward to discovering what happens in the next instalment. With writing the interactive novel I have no idea what happens week by week and it makes the process daunting. Find out what you voted for on Friday the 2nd November when the second instalment is published at 5pm GMT along with a new set of choices to vote on. In writing the Interactive novel I need a few guidelines or rules on how to make it work. to find out what they are look below. The Interactive Novel is a novel with a difference. 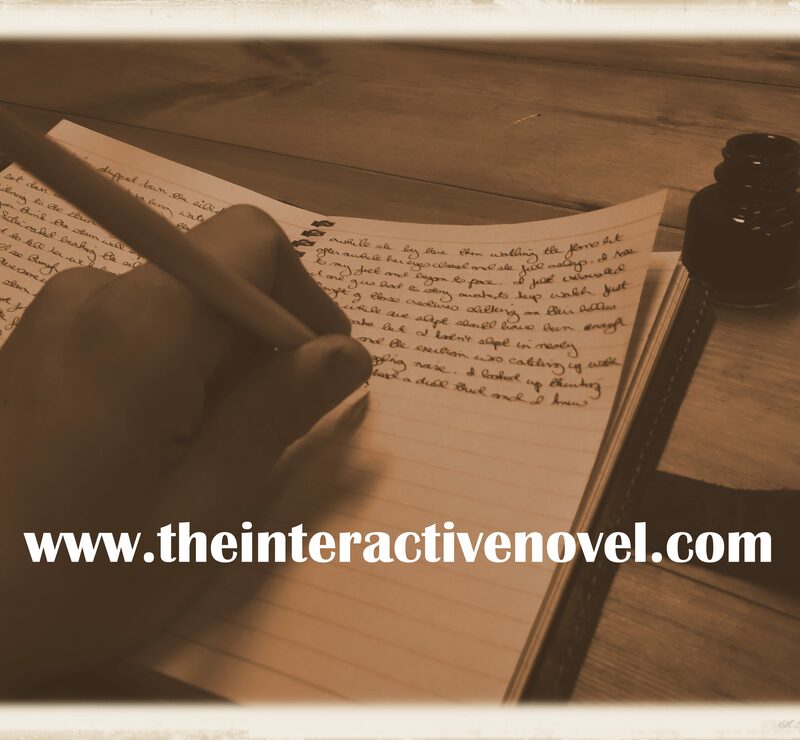 Written and published in instalments the interactive novel allows you the reader the chance to influence a novel like never before. Each instalment of the novel will be published as a downloadable pdf found at http://www.theinteractivenovel.com or readable as a blog found on the website. With each publication the reader will be asked at least one multiple choice question on what happens next or during the novel. The answers to these questions will form a vote for what happens next or during the interactive novel. The options that receives the most votes will be the winner and will alter what happens during the novel. The Interactive Novel works on a weekly cycle. Each instalment will be published 9 PM GMT on a Friday. The choices to vote on with also be published at this time. Once the novel is complete it will be edited to take out any mistakes or small inconstancies in the plot. On no account will any of the choices made by the readers be altered at this stage. The interactive novel is back. But what is it and how does it work? The interactive novel is a novel with a difference. Each weekly instalment will end with at least one poll for the readers to choose what happens next. Readers will be given the opportunity to decide everything from what happens next, to setting, characters that appear and their actions. As part of the Journals of Nigel Briggs series, the interactive novel follows the adventures of Nigel Briggs. Fifteen-year-old Nigel is assistant to Professor Ashcroft, debunker of the supernatural in Victorian Britain. While Professor Ashcroft is certain that there is a scientific explanation to the phenomena they investigate Nigel suspects that there is some darker force at work. The technical problems have been fixed and the interactive novel is back. The first instalment will be published tomorrow and voting begins then on what happens next. My apologies for any inconvenience. With under two weeks until the interactive novel begins, I have discovered that the software running my website is no longer supporting polls and forms. It means that no one has been able to vote on what they want to happen in The Interactive Novel since the end of August. To say this is a kick in the teeth is putting it mildly. At first, I want to apologise to anybody that has tried to cast their vote and been unable to. Thank you for trying to take part and I appreciate it. I am working to remedy the situation and will get the ability to vote on what happens next working as soon as possible. Unfortunately to make sure it is all working and to allow readers the chance to vote I have taken the hard decision to delay the beginning of the interactive novel. I aim for it to begin with the vote deadline at the end of the first instalment for the end of October. I thank you for your patience and will keep you updated.